As many folks were in worship services this past Sunday morning, a series of storms moved across the metro with high wind and torrential rain. Two in particular hit portions of Bartlett very hard with severe winds. To set the stage, a great deal of rain fell over the previous week, including over 3 inches the previous weekend, another storm that dropped more than an inch mid-week, and finally another inch-plus over the weekend on which the storm damage occurred, leaving the ground saturated and vulnerable to falling trees in the high wind. The first round of strong storms in Bartlett occurred between 8:30-9:00pm. Here's a radar loop that ends around 8:15, just prior to the storms reaching Bartlett. Those storms produced straight-line wind that uprooted 5-6 mature trees, including the very large oak shown below, near and just southwest of the intersection of Billy Maher Road and Old Brownsville on the north side of Bartlett. No warning was in effect at the time. An uprooted tree that fell at the corner of Billy Maher and Old Brownsville in north Bartlett during the 8:30am storm. There were several others in the same area that also feel during that storm. Photo credit: Erik Proseus. This storm cause more extensive damage. In fact, I was able to trace an approximate path based on fallen trees from Stage Road and Kirby-Whitten in the middle of Bartlett north to Old Brownsville Road east of Oak Road, a distance of nearly 4 miles. The map below shows the areas where fallen trees and damage occurred, with the most extensive damage on Broadway Street south of Shadowlawn Road, where 4-5 mature, large oak trees were uprooted. In addition, in the Easthill subdivision south of the Broadway damage, multiple large trees were also uprooted, including one that fell over a house, splitting it in two. 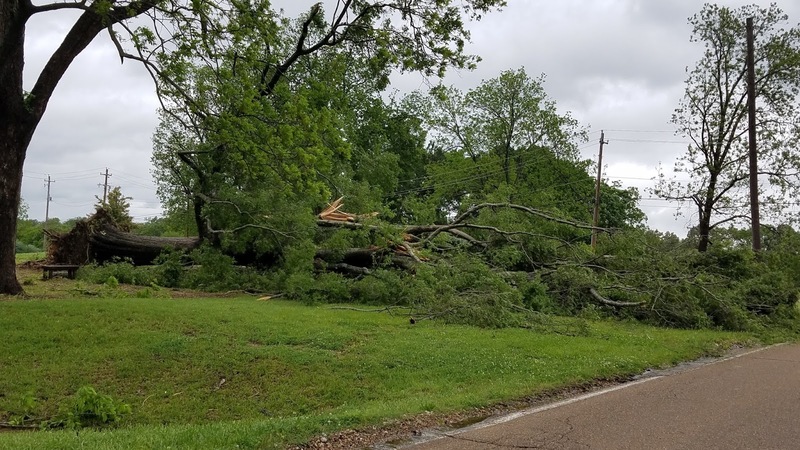 Just south of the Easthill subdivision, in the wooded Bartlett-Ellendale Cemetery, one large oak tree was snapped off about 30 feet above the ground. Pictures of this damage are shown below. An approximation of the wind damage path through Bartlett around 11:45am Sunday morning. Highlighted areas are where downed trees and/or damage was noted, with the direction they fell indicated by the arrows. 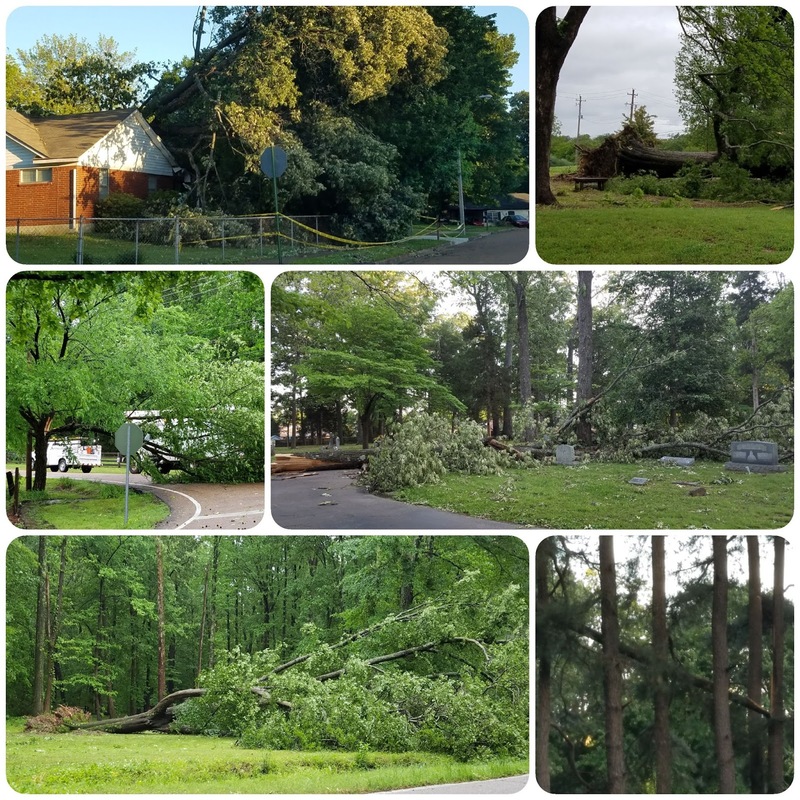 Photos taken of tree damage during the late morning storms in Bartlett. These photos were taken at Bartlett-Ellendale Cemetery, Easthill, Broadway Street, and Old Brownsville. Photos credit: Erik Proseus. 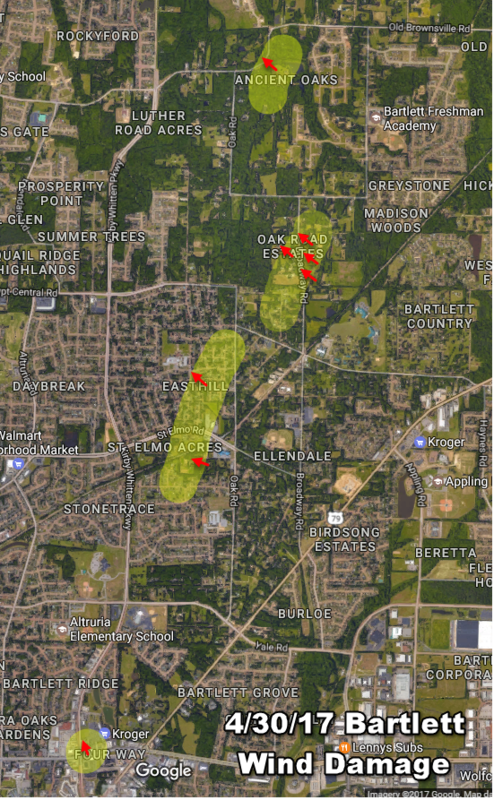 An analysis of the direction that trees fell (as shown in the map above) and the lack of damage to any structures other than those hit by falling trees indicates that the damage was likely the result of straight line wind, produced by a microburst (or perhaps multiple bursts). A microburst is produced by strong downdrafts from thunderstorms. The fact that the ground was saturated made it possible for lower than normal wind speeds to uproot the trees, although a couple of trees that were snapped well up the trunk indicate that there were some very severe winds in the storms. Based on damage indicators and degree of damage used by the National Weather Service, in my estimation the straight-line wind associated with each event was likely severe (60 mph or stronger) with roughly 75 mph wind gusts required to uproot trees of the size that were toppled. The trees that were snapped off could have seen wind gusts of 80+ mph. This wind is equivalent to an EF-0 to low-end EF-1 rating had it been a tornado. However, there are no indications from my unofficial assessment that a tornado occurred in these cases. Damage primarily to trees and power poles. Minor damage to Crestview Middle School.